Many generations ago, the Cherokee had inhabited the lands of the sacred Great Lakes alongside many other tribes, but the histories tell that the elders led their people to forsake this sacred realm and begin anew in the warmer lands far to the south. The keepers of history disagree on the reasons for this great uprooting, but many say the elders grew wary of the powerful Iroquois Federation as they watched it ambitiously dominate their fellow tribes. Though many other tribes might have looked to the great Cherokee to lead the struggle against the Iroquois, the clan totems led the elders down a different path. Rather than pursue a fruitless war or submit to their rival's rule, the clans of the Cherokee journeyed south in search of a new home. After many years, they settled in the land of Overmountain, where they found fertile valleys, boundless hunting, and protective mountains that would keep them safe, hopefully preventing the Cherokee from ever needing to abandon their homes again. ​Despite this period of strife, the Cherokee did not ascribe to the migratory nature of most tribes, and were a people well educated in the beneficial attributes of communal agriculture. This tradition had allowed the Cherokee to form a numerous and cohesive nation, led by a wise and reliable administration, that had outpaced most of their former northern neighbors and was a dominant political force in their new region. Only one of the strange local tribes that the Cherokee had encounter in these southern lands had proven powerful enough to threaten the Cherokee, and the tribe's warriors have clashed with these Creek many times in disputes over the Cherokee's southernmost hunting grounds. Other, more distant tribes had proven friendly, however, and the Cherokee had more allies than enemies. The reigning chief, Tistoe, is unambitious and uninspiring, but his long and stable rule had proven prosperous and the clan elders sensed a time of unprecedented progress beginning for the people of Overmountain. New ideas surrounding the organization of community wealth, the use of symbols to convey communication, and the evolution of organized spiritual traditions was changing society at what many felt to be an unprecedented rate. Though further conflict with the Creek looked likely, enterprising Cherokee leaders and traders had developed strong ties within the neighboring cultures that was leading to a growing Cherokee influence abroad. Discounting the unlikely chance of some major and unforeseen upheaval to the region, the future of the Cherokee appeared promising. Chief Tistoe's advisers from among the rising men and women of his tribe had long urged him to begin building ​upon the rising influence of the tribe in the greater region's politics. With a war against the Creek looming on the horizon, the chief reluctantly assented and sent representatives to all the tribes that might have cause to challenge the mighty Creek. The Choctaw responded favorably to their overtures, eager to turn the tables against their rivals, the Chickasaw, allies of the Creek, though this meant the would Chickasaw refuse any treaty with the Cherokee because of their friendly relationship with the Choctaw. The Osage tribe, threatened by the Chickasaw, was also willing to support the Cherokee in exchange for mutual assistance, and thus was formed the Yuchi Federation, named after the sacred site of its first official meeting. As the largest of the tribes and the framer of the federation, Chief Tistoe and his advisers assumed the leadership of the assembly, with future leaders to be determined by election. Prompted by his advisers and commanders, Chief Tistoe brought war to the Creek to end the disputes over the hunting grounds of Coosa and break the toxic stalemate between the tribes. By striking first, the Cherokee were able to attack the Creek army with the help of the Choctaw warriors before the Chickasaw could attempt to intervene. Though the Battle of Muskogee saw the Creek military might irrevocably crushed, the war with the Creek and Chickasaw would drag on for more than a year, as the tribes struck at each others' villages and the Yuchi Federation hunted and cornered the crafty Chickasaw warriors. In the end, the Creek and Chickasaw were humiliatingly defeated, and their people forced off their land or subjugated by the victors. 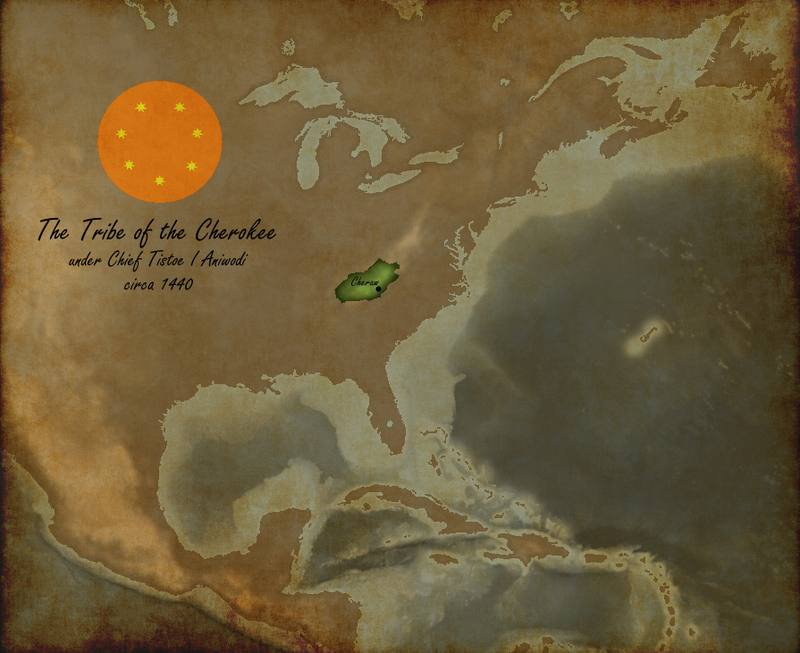 The Cherokee now ruled a substantial population of Creek clans in the lands south of Overmountain with a language and customs that were unrecognizable to their new overlords, and this prevented any helpful integration from taking place. Only a few years after the conquest of Coosa and Muskogee, the villages in these provinces erupted into violent revolt, killing Cherokee officials and defeating the Cherokee army twice before Chief Tistoe organized a determined response. Though the rebellion was routed, and the Creek were forcibly pacified, it was clear that significant steps would need to be taken before the lower provinces would ever consider themselves part of the Cherokee nation. Chief Sequoyah saw great potential in the unifying force of the priesthood and was determined to reduce the traditional diversity that caused much conflict between the tribe's clans. Through a series of conferences, the chief pushed the majority of the tribe's elder priests to come to terms on spiritual traditions that should be shared across the whole Cherokee nation. The enforcement of these practices, including extensive use of animal and crop sacrifice and the performance of significant coming-of-age rites, would lead to increased identification with the greater Cherokee nation and serve to uplift the central rule of the chief. With advances in administrative centralization and agricultural irrigation techniques providing substantial surpluses in the tribe's food production and population growth, Chief Sequoyah saw an opportunity to use this income to spread Cherokee control over the wild clans that inhabited the Cherokee frontiers. The chief organized an expedition of volunteers to establish a distant village that would bring Cherokee farm techniques to the fertile valleys of Yadkin and provide a center of trade for the regions clans. Through this method, the wild clans would be exposed to the benefits of agriculture and become involved with, and dependent on, Cherokee political institutions. Given the success of this initial experiment, the visionary chief foresaw this method establishing a Cherokee hegemony far and wide from Overmountain. Prompted by the migration of the Creek warbands and their allies onto hunting grounds and holy sites under Cherokee protection, Chief Sequoyah called on the Cherokee warriors to destroy the Creek's rival federation. With their allies within the Yuchi Federation, they descended upon the enemy and were victorious in the great battles over the valleys that were their federation's namesake, but Chief Sequoyah was unfortunately killed in the very first fighting. A great leader and student of Sequoyah, named Amokontakona, stepped into his fallen mentor's shoes and led the tribe against the numerous enemy. Amokontakona was quickly elected chief of the Cherokee and leader of the Yuchi Federation before personally hunting down the Chickasaw and Wichita warbands and capturing their villages. The defeat of the Creek Federation was complete and Chief Amokontakona decided that the best way to prevent such wide-scale war in the future was to bring these diverse people under Cherokee rule, preventing them from raising their own chiefs, and attempt to incorporate their inferior culture with that of the Cherokee in some way. By this method, the rule of Cheraw extended through the lands of Tennessee to the Mississippi River. Despite the hopes of his predecessor, Chief Boudinot was called on to defend the authority of his Federation when travelling tribes from far off lands migrated into the lands of Kentucky. The ensuing attack on the Fox tribe would ignite war all across the forests of Kentucky and Ohio as other tribes honored their pledges of support to the participant. Though the tribes new generation of warriors had yearned to test their mettle against worthy foes, the war against the Fox would prove far bloodier than any had expected and not many who went to battle with the Cherokee warbands would survive to return home. Eventually, after a two year campaign that occupied the enemy homelands and routed their warriors, the defeated tribes were forced to turn over their stockpiles to the Yuchi Federation and pay tribute for years to come. The Miami were forced into the Cherokee clan hierarchy as a vassal tribe, bound by further oaths of tribute and allegiance. Word had reached the chief, through traders who had traveled from far north, that a strange new people had appeared on the coast of the ocean. They had arrived in ships far larger than anyone had ever seen, and possessed many wondrous things like protective metal armor and horses. When these English appeared in Cherokee territory, Chief Attakullaculla sought to learn as much as he could about these people at the recommendation of his priests. The first uses of firearms, armor, and horses were witnessed, and the chief learned that the strangers had journeyed from far across the ocean. Of particular interest, though more difficult to ascertain, was their purpose. By the time of their departure, most of Attakullaculla's elders and wise-men agreed that the strangers, these English and other Europeans they described, wished to control this land. Attakullaculla bent his advisers to the task of studying their ways and fearful weapons in order to better prepare for a future that his diviners found to be worryingly clouded. Cherokee rule and production methods had allowed their population to rapidly grow and their influence to spread. The law of Cheraw governed villages from the ocean in the east to the Mississippi River in the west and connected many diverse cultures. Their prestige and importance was such that other small tribes would consider leaving their independent traditions behind in order to join this growing nation. The Potawatomi and the Arapaho both were willing to submit to Chief Attakullaculla in order to tie their fates to that of the Cherokee. As had been learned earlier, the Europeans were diverse and had competing tribes of their own, so he was not surprised when new groups of mysterious outsiders appeared in his realm. The Castilians' desire to map Cherokee lands foreboded conflicts to come, but Chief Teekalohenah assigned his brightest scholars to assist the explorers in order to learn more about their writing and mathematical methods. Unfortunately many of his men who spent long periods of time with the Castilians became fatally ill in unnatural ways entirely unknown to his medicine men. When the foreigners returned south from whence they came, Teekalohenah was not sad to see them depart. The European visitors had uniformly expressed great interest in the ancient burial mounds found in Overmountain, and were dissatisfied in all Cherokee explanations of their creation. Chief Teekalohenah decided that much could be learned in the recreation of these engineering feats and decided to invest vast resources in the construction of new burial mounds, more immense than any found before. Though many were displeased in what could be a deemed a vain and fruitless project, the mounds quickly became widely famed and the project would serve to draw talented artisans for far abroad to Cheraw and solidify their spiritual authority among the tribes. ​For unclear reasons, massive outbreaks of new diseases that had become associated with the European interlopers began to breakout among the population centers of the Cherokee in the later years of Teekalohenah's. Far from anything in the experience of the tribe's medicine men, the epidemics raged for many years with horrendous fatality rates. Those who became ill and survived were often disabled in ways that prevented them from caring for themselves and left them disfigured. This assault on their society by such powerful demonic forces paralyzed much of the Cherokee government and shook the people's confidence in their traditions and beliefs. Chief Teekalohenah and his predecessor were sorely tasked to hold the weakened tribe together during this apocalyptic era. Ostaiah had spent many years traveling among the European colonies of Newfoundland on the far northern coast while treating with the Great Lakes tribes and their neighbors, and was elected by the stricken Cherokee people in the hopes that his radical views on reforming Cherokee society might bring back their former prosperity. As the chief, Ostaiah ordered new communities founded close to the Castilian colonies in Florida, and brought all his new administrators, wise-men, and commanders there to learn the European methods, skills, and technology. Over only a few years, Ostaiah used this newly educated regime to rip away many of the oldest institutions of the tribe and replace them with models based upon the European governments but of his own unique design. Though this caused chaos and unrest throughout his realm, Ostaiah was encouraged by the surprisingly rapid adoption of his reforms. The Totemic priesthood assisted greatly in this transition and translated new systems and customs into forms more palatable to the Cherokee perspective, ensuring that the people did not lose touch with the spirit-world and their ancestors. Though it broke with tradition, they supported the stabilizing establishment of hereditary rule and Ostaiah Degataga became the first Duke of the Cherokee, Ruler of Overmountain, and Lord of the Creeklands. The first test of the Degataga Reformation was a minor conflict with the Choctaw. The Cherokee relationship with the Choctaw had wavered between friendship and rivalry over the many decades, but as the movement of trade goods had grown more important to the Cherokee economy Ostaiah wished to extend Cherokee power towards the Mississippi delta. The Choctaw resisted diplomatic attempts to bring them into vassalage, so the duke ordered his warriors to force their compliance. Though allied tribes came to their aid, the reformed military of the Cherokee, incorporating mounted warriors, firearms, and complicated European regimental tactics into the traditions of their warrior societies, easily defeated the more numerous foe. Witness to the superiority of the Cherokee, the Choctaw accepted their place in Ostaiah's designs and demonstrated great loyalty from that point onward. The lands of the Patowatomi tribe were becoming increasingly important to trade through the Ohio valley as production of tobacco and cotton grew around the Mississippi river and the demand for furs from the region increased. The desire to control the movement of these goods had caused significant diplomatic focus on aligning the Patowatomi leadership with the government in Cheraw, and the rule of Duke Ostaiah saw their administration fully integrated into that of his own, bringing the Cherokee increased control over the Ohio markets. The Shawnee, traditional allies of the Cherokee, now found themselves thoroughly overshadowed by Cherokee influence in the region and utilized their favorable relations to secure a position as an autonomous vassal of the government in Cheraw. Upon his untimely death, Duke Ostaiah's vision would be taken up by his wife as she assumed the regency for their young son. Unafraid of her responsibility, she would guide the Cherokee through their first direct conflict with the Europeans and into the spiritual revolution that naturally followed as a response to the Degataga Reformation. When Duchess Tecumapese became aware of significant problems among the many Castilian colonies of Florida, she sensed an opportunity to challenge the growing European influence. While pursing a friendly relationship with their rivals from England, the duchess sent her warriors to occupy the Castilian colonies. In previous years the colonies had seemed prosperous, growing rapidly with frequent new arrivals, but now they appeared destitute and abandoned by their patrons. Many were perishing from starvation and there was no defense to speak of. The Cherokee commanders soon learned that a terrible war in the European homeland had devastated their armies and bankrupted their economy. Over the previous decade, the arrival of highly valued dyes and precious metals from Mexico into Cherokee lands had stopped as these good were instead being taken by Castilian merchants on ships to the Caribbean and Europe, and Tecumapese decided that she was now in a position to correct this. Her forces marched to the distant Rio Grande delta, where a Castilian colony controlled access up the mighty river to all the inland villages along its banks. Here the Cherokee defeated an outnumbered colonial army and took control of the port and the river. At her direction, the Cherokee commanders negotiated peace with the helpless colonists in return for the annexation of northern Florida and the Rio Grande colony. Though the Cherokee now ruled over them, very few of the thousands of Castilians living in these prosperous colonies would abandon their new homes, unwilling to return to the homeland they had left behind to start new lives in Florida or Mexico. Tecumapese's administration would now face challenges without precedent for the Cherokee people as it wrangled with integration of the Castilian institutions and governance of the distant Mexican settlements. The Cherokee administration had a long tradition of including and integrating the neighboring tribes despite stark difference in their cultures, and they were confident this would allow the Castilian populations to become thriving members of the Cherokee nation. However, certain spiritual traditions had always tied together the Cherokee, the Creek, the Chickasaw, and the Potawatomi, and these were absent among the Europeans. The Catholic church was an institution that held the Castilians apart from Cherokee society and bolstered rebellions against Cheraw's rule. Though these rebellions were violently put down, the Catholic faith was not suppressed under Cherokee rule. Its priests had been frequently visiting Cherokee settlements for decades and had found significant sympathy from the Cherokee population during the bleak trials of the epidemics and the subsequent cultural reforms, and was even supported by the duchess and her son. When Duke Oolassoteh reached majority and assumed his rule, he announced his own acceptance of the Christian faith and commanded his priests to begin instructing the Cherokee people in its doctrines. Though his advisers warned that many of his subjects would resist the tenets of this foreign religion, the duke was confident that the benefits would prove worth the struggle. ​Following his mother's policies on restricting European control over local resources, Duke Oolassoteh maintained alliance with the Sioux tribe that inhabited the lands at the mouth of the Mississippi River. When the Portuguese arrived to take this land from the Sioux, the duke marshaled his soldiers to defend the small tribe. The combined forces of the Cherokee and Sioux fought multiple battles with the invaders along the southern coastline and succeeded in denying the river delta to the enemy. After the conflict, however, the Sioux would choose to migrate from the area as Portuguese settlers, fleeing from religious persecution and political conflicts in their homelands, continued to arrive in the sparsely populated hunting grounds surrounding their settlements. Catholicism was slowly being accepted, spreading from the Castilian settlements in the south towards populations centers in the north, but Oolassoteh could see trouble looming on the horizon. The rapid changes in the Cherokee nation over the past decades were a constant destabilizing force on his people, and their acceptance of the Christian church was doing nothing to prevent the increasing number of conflicts with the Castilian and Portuguese invaders. The Cherokee duke rejected the methods of control and coercion that the European priests taught him, used to subjugate the masses in their homeland, as they ran afoul of his personal beliefs and were not in accordance with the teachings of their own faith. Following in the radical footsteps of his parents after much deliberation with his most trusted priests, Cherokee and foreigner alike, Oolassoteh declared that the Cherokee would have their own Christian church, without European authority, for he envisioned a church that valued the totemist teachings of their ancestors as highly as the teachings of the bible. Unfortunately, this religious rebirth would cause cultural chaos before it would become the unifying force of Oolassoteh's dreams. The rapid introduction of new ideas, technology, and religious doctrine in Cherokee society eventually culminated in a period of widespread chaos across the realm. Subjects in multiple regions turned against the central authority of Cheraw in violent uprisings and even attempted assassinations. Rebellious mobs and warbands demanded the removal of the ruling family and the return to ancestral traditions while Castilian communities attempted to enforce the rules of the Roman church or break away to rejoin their colonial brethren. This period saw the technological and economical growth of the Cherokee flounder and stagnate to the frustration of its leaders, as all administrative energy was devoted to stabilizing the unrest. Tuskeegatee's reign began with a northern campaign to end territorial conflicts between the Shawnee and the Illiniwek. The short conflict enforced Shawnee claims over the disputed lands. At the expense of their progressive agenda, the government in Cheraw had devoted much of their effort over a decade on solidifying the rule of the Degataga dynasty and their administration. Eventually, years after the death of Duke Oolassoteh, founder of the Cherokee Church, his son was able to see the fruits of this labor as the support of the population once again returned to the monarchy. The clergy were beginning to gain traction in the realm's largest population centers, but unfortunately a backlash against this progress would soon turn popular opinion against the Degataga again. ​In an attempt to increase loyalty among its vassals, Duke Tuskeegatee negotiated the official acceptance of the Cherokee Church among the clans of the Choctaw. In exchange for supporting the church, however, the Choctaw required a level of autonomy that would prove impossible to rescind in the future. This policy would not be pursued with other tribes, and they would be allowed to continue pursuing spiritual traditions of their own choosing. The slow growth of the church met a determined resistance by both Catholic and totemist traditionalist factions. These groups hindered government reach and administration and fomented unrest wherever they could, but the tolerant nature of Cherokee society removed the provocation that would have allowed these groups to organize a militant rebellion. Nevertheless, the resistance would always be working to oppose the official agenda and lead the disgruntled against the feudal regime. Informed on the state of disunity within the Cherokee, European powers sought to take advantage of their weakened state. Castilian armies from Florida and New Castile marched to reoccupy the Castilian settlements their kingdom had lost a generation ago, but the Cherokee soldiers rallied and drove them back after losing initial engagements. The Europeans controlled the sea and could easily move their armies along the coast, but could not hold the settlements they occupied. Duke Tuskeegatee led the Cherokee to repeated victories and countered by invading New Castile, pillaging their mining operations in the Mexican mountains. The duke would only release the colonies back to the Castilian king after substantial monetary reparations, and he regretted lacking the administrative resources to take over their colonial operations for the Cherokee permanently. In tandem with the Castilian invasion, the king of Portugal again attempted to uproot the Sioux population on the Mississippi. As had his predecessor, Tuskeegatee defended the Sioux clans, and Cherokee and Arapaho forces drove the European soldiers from the Sioux lands and then invaded the Portuguese settlements along the delta and the gulf coast. With the defeat of the Portuguese, these settlements would fall under the rule of the Arapaho, vassals of the Cherokee, and their inhabitants would be forced to deny all allegiance to the throne of Portugal. The prosperous colony of Chitimacha would come under direct control of Cheraw's authority and become the center of the nascent maritime efforts of the Cherokee in the Gulf of Mexico. Sawanooekee Degataga inherited the throne at a very young age, and this left his mother with an abnormally long reign as regent. Her stalwart leadership protected her son's domain through protracted series of conflicts with European powers who seemed to have little interest in diplomacy with the Cherokee. Duchess Nanyehi's ability to firmly hold her son's seat, and effectively and decisively rule in his name, prevented the chaos and decline that would have resulted from the political infighting that typically follows a regency. English settlers had arrived along the Chesapeake Bay during the reign of Oolassoteh and relations had been friendly with their colonial settlements, but this relationship suddenly fell apart at the arrival of forty thousand English soldiers with orders to invade the prosperous Cherokee heartland. Aware of the inferiority of her forces, both numerically and technologically, Nanyehi ordered her commanders to avoid engaging the English army and instead worked with her Huron allies to pillage the lightly defended colonies of New England in retribution for the attacks in Chesapeake and Tuscorora. While she trusted in the defenses of Overmountain to protect her people, she could not defend the farmlands sought by the English. 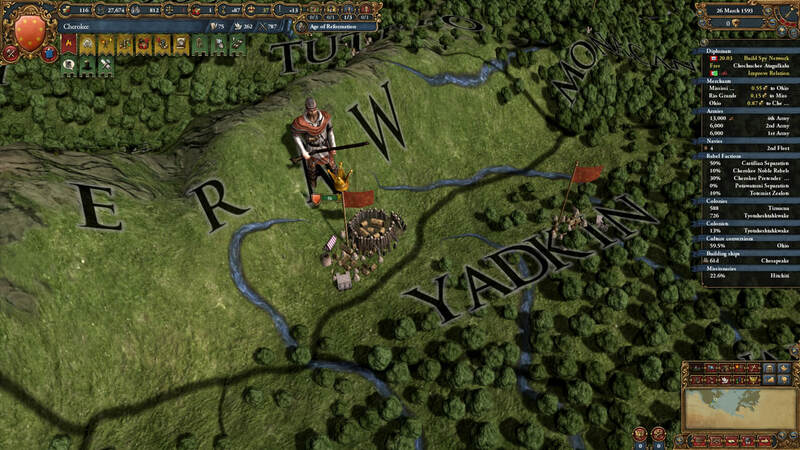 After years of retaliatory raiding and the inconvenient resumption of conflict with the Portuguese, Nanyehi was forced to abandon the lands of Monacan and Yadkin to the English aggressors. In league with the English, Portuguese forces from the Caribbean landed in Florida and along the gulf coast, pillaging and occupying the local villages. 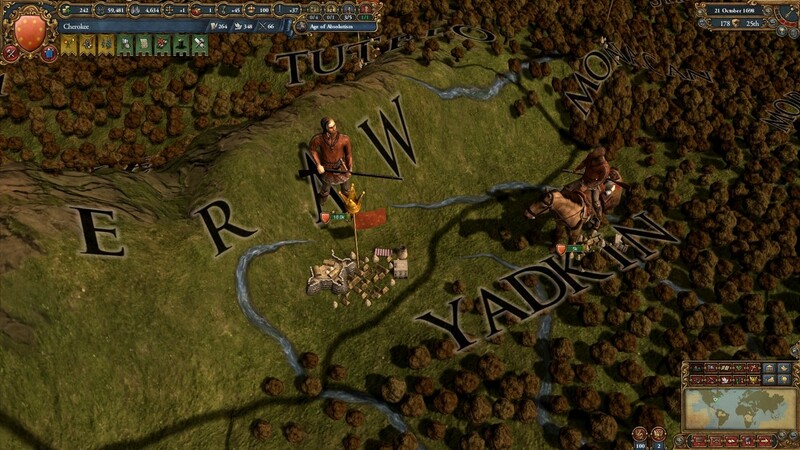 With negotiations concluded with the English, the Cherokee forces preserved by Nanyehi's diplomacy descended upon the Portuguese with vengeance, quickly routing their armies. The last of the Portuguese settlements around the Mississippi were easily conquered, and though the settlers would prove troublesome and unruly in the coming years, this marked the end of Portugal's presence on the continent. ​Realizing that the expansion of English control must be stopped if the Cherokee were to be secure, Nanyehi decided that the native nations of the Great Lakes must be joined to the Cherokee if they were not be conquered by the Europeans. The closest and most powerful of these, the Iroquois, resisted the loss of their independence, but lacked the numbers or alliances to resist the forceful removal of their leadership by the Cherokee army. Nanyehi established a new Iroquois government, subordinate to the Cherokee, that would allow the two peoples to work in tandem against the growing threat of European incursions from New England, Newfoundland, and Canada. The last strongholds of the Castilian Florida colonial government were in the southern Florida peninsula and in Alabama. When the young Duke Sawanooekee declared the end of his mother's regency, he aimed to show his strength by capturing the vulnerable settlements of Alabama that hindered Cherokee movements along the gulf coast and housed a valuable iron mine and weapons manufactory. With no support from their beleaguered patrons in Toledo, the colony was easily occupied and annexed, but the growing numbers of Castilian colonists under Cherokee rule would continue to cause frustrations in governance. The occupation of Yadkin by the English had shaken the Cherokee administration and the faith of its subjects, and Sawanooekee was determined to right this wrong at the first opportunity. When the English engaged in an invasion of the Musica clans deep in the rough terrain of Columbia, Duke Sawanooekee sent the Cherokee armies to reconquer Yadkin and overrun England's coastal colonies. This was followed by a longer campaign into New England alongside the new Iroquois forces. After a year of raiding and occupation, with no sign of assistance coming from the English crown, the colonial government agreed to withdraw to the Chesapeake Bay and relinquish control of Fort Nipmuc along their border with the Iroquois. When the Europeans arrived on their shores, the Cherokee had quickly learned that their society had no match to the efficient administrative systems and novel technologies of these new invaders. Ambitious Cherokee leaders had pressed rapid change and adaptation upon their people in order to not be swept aside and, following his decisive victories against the European kingdoms, Sawanooekee decided it would be no vain boast to declare his realm now their equal. 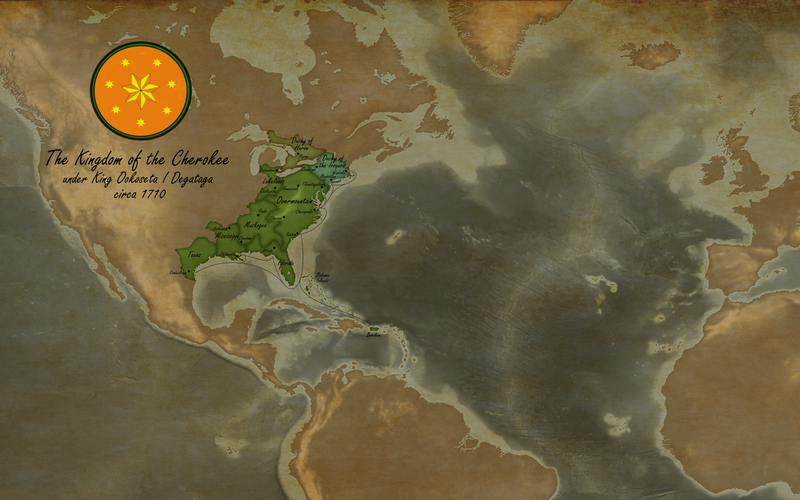 With great ceremony, he was crowned as the first King of the Chereokee, Protector of the Tribes, and Cheraw would now pursue its diplomacy with Paris, Toledo, and London as a peer on the political stage. In his first acts as king, Sawanooekee made it clear that there would be no discrimination between his Cherokee and European subjects. He ruled over many thousands of Castilian and English settlers now, productive members of his kingdom that now contributed much in keeping the Cherokee apace with their European rivals. Their culture and customs would be respected and protected within the Cherokee Church and in King Sawanooekee's administration, for the king recognized that their peoples could accomplish more together than would be possible by either on their own. This vision was furthered by the founding of a network of universities spread throughout the major towns of the Cherokee realm. Financially supported by the crown, these institutions would draw from the brightest minds of the Cherokee, Arapaho, Shawnee, English, Castillian, and Portuguese communities alike for the greater good of the Cherokee nation and promote cooperation across the cultural divides. A dozen years after their last war with New England, the Cherokee soldiers again marched on the now weakened colonial settlements. The English had occupied many of the fertile river valleys that lay between the Cherokee and Iroquois heartlands, blocking access through the region, and King Sawanooekee desired to remove these intruders. The warmongering kingdom of Great Britain was now embroiled in conflict within the Holy Roman Empire and, as anticipated by the Cherokee king, again neglected to provide adequate protection for its downtrodden colony. The colonial government was forced to remove itself from the greater Delaware Valley area, and allow the Cherokee and Iroquois to assume the governance of the settlements built there. The British king found an opportunity for retribution on King Sawanooekee by supporting the rebellion of the Choctaw. The Choctaw dukes had refused to support the administration in Cheraw for decades and desired to separate themselves from the Cherokee government, but the Sawanooekee could not allow such divisions to cause cracks in the defense of his realm. When the Choctaw declared their independence, the British army landed on the southern coasts to support their betrayal. They besieged Fort Hitichi, which capitulated under heavy bombardment while the Cherokee warriors routed an army sent from New England to pillage the northern territories. King Sawanooekee met the primary British force on the banks of the Chattahoochee river, but was handily defeated by the disciplined enemy. Witness to the horrible losses of the battle, and realizing that he had lost the initiative if he had ever possesed it in this conflict, King Sawanooekee relented and granted the Choctaw full independence in exchange for the withdrawal of the British army. Eager to restore the stature of his kingdom and enact retribution on his terms, Sawanooekee meticulously planned his offensive against the Choctaw. The Choctaw forces were easily overwhelmed by the Cherokee and Arapaho, and even with the threat of the eventual arrival of their distant allies British allies, they possessed scant leverage with which to maintain their independence. In short order, they were forced to turn over control of all the Castilian settlements along the gulf coast that they had conquered while in league with the Cherokee as well as break their ties with the British. The first act of Cheanoka's reign was to end the the autonomy of Choctaw. Under the coercion of the Cherokee military, the duchy was incorporated into the greater Muskogee region under the direct rule of the king. Though their lands had been forcefully annexed by the colonial government of Canada, the Huron had quickly rallied to rebel against the French invaders and successfully removed their French overlords. Though it was inevitable that his people would soon be threatened by the Europeans again without assistance from the Cherokee kingdom, the noble leader of the rebellion was unfortunately too arrogant to accept King Cheanoka's offers of unity and protection with the Cherokee. Before this cold come to pass, the king ordered his soldiers across the borders into Huron territory. The outnumbered forces of Huron retreated before the Cherokee advance, abandoning the town of Huron itself where King Cheanoka imprisoned the ruling family before uplifting a new noble house, one sympathetic to his vision for their people. One thing that did not leave with the French when they were ousted by the Huron was the Catholic religion, now strongly rooted in the region. Cheanoka was unsure if the differences between the teachings of the French missionaries and those developed by the Cherokee Church would cause a divide between his people and the Huron, but he was unwilling to cause further strife by persecuting their clergy. The Cherokee nobility and their vassals had been pushing back against the European invaders for a century now, with growing success, but they were not the only nation making such progress. The Totonac had shown signs of surpassing the petty strife that had engulfed the tropical lands of the Nahuatl and Maya, and Cherokee diplomats had offered them any assistance they could in hopes of securing a helpful ally in the south. When the Totonac attacked the colonists of New Castile, King Cheanoka, sent his own soldiers to support the Totonac in their conquest of the region. The power of the Castilian monarchy in Europe was known now to barely extended past the walls of Toledo, and the colonist were predictably unsupported by their king and brought under Totonac rule. While the Huron members of his advisory council were no doubt motivated by their selfish desires to see further power restored to their duchy, King Ookoseta was aligned with their desire to recapture the Huron holdings still held under French hands. While the colonial government defended against an uprising of their own peasants in their capital, Cherokee, Iroquois, and Huron regiments occupied Ontario and many other inland towns, unchallenged. These were soon annexed by the Huron administration. Following their success against the French, King Ookoseta turned his attention back to the settlers of New England. Fortunately, the powerful European kingdoms of France and Great Britain were far more focused on their mutual rivalry than the welfare of their distant colonies, and Ookeseta's armies easily overwhelmed the coastal settlements once again. With their solders and government driven into exile the king claimed the many prosperous towns and harbors of Connecticut and Massachusetts and placed them under the governance of the Iroquois nobility. 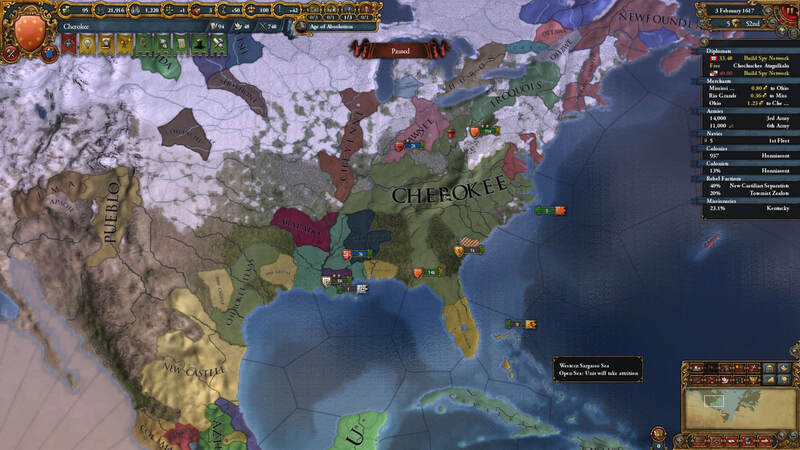 King Ookoseta's campaign next turned to the few remaining autonomous communities in Castilian Florida where even less resistance materialized against the expansion of Cherokee control. Though not by their own choosing, the settlements of Castilian Florida were integrated into the Cherokee kingdom with little bloodshed, joining the large population of Castilian descent that already inhabited the towns of the southern coasts. The Cherokee culture had no tradition of sea travel, but had long ago witnessed the advantages it brought to the invading Europeans and had invested in the construction of fleets for mercantile use for decades now. With a quickly growing number of harbors and shipyards under the command of the Cherokee king, Ookoseta began to envision a Cherokee navy that could compete with the European armadas that commonly prowled his coasts with impunity. After its completion, King Ookoseta's first small fleet of modern warships was sent to challenge Scottish control of the nearby Bahamas. The island chain and its colonies were quickly occupied and confrontation with the Scottish was pursued in the eastern Caribbean as the colonial government attempted to retake its settlements. Though the British army was engaged in a long-standing war with France, the British navy supported the Scottish colonies and hunted the outmatched Cherokee fleet relentlessly. 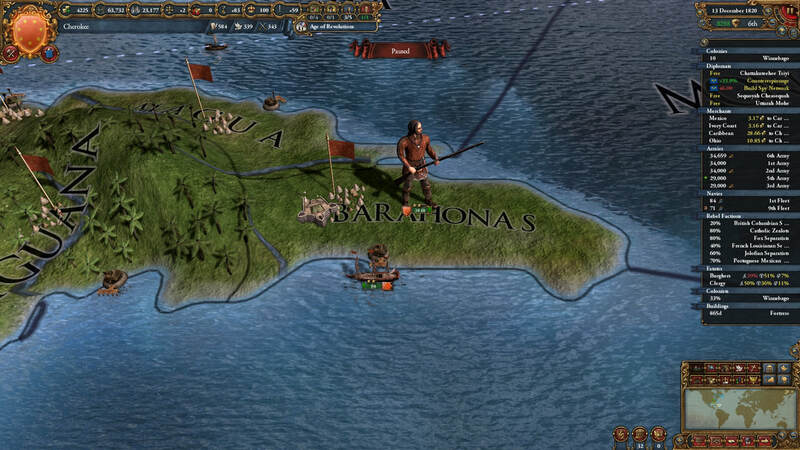 A Cherokee landing on the colonial capital in Trinidad was repelled, but the Scottish were unable to retake their Caribbean Islands and ultimately relinquished the Bahamas and distant Boriken to King Ookoseta. The dukes of the Arapaho had struggled to control the Portuguese communities of Mississippi for generations, and the administration in Cheraw had come to see the duchy as corrupt, ineffective, and financially moribund. Through significant investments of time and resources, King Ookoseta peacefully stripped the reigning Arapaho dynasty and clan of most of its political power and placed Mississippi under a new regional council that answered directly to the government in Cheraw, allowing the enlightened policies of Ookoseta's reign to stabilize the diverse population and encourage development across these logistically important provinces. The Mohe clan, an influential family with roots from long before the establishment of the monarchy, enjoyed unsurpassed power in the realm during Queen Nanyehi's short regency for her young son. Short as it was, however, her reign had few far-reaching effects on the nation. Originated during his father's last years and refined by his advisory council during the regency, King Kolakusta commenced an invasion of Cuba shortly after ascending the throne in Cheraw. This war was the kingdom's first attempt at exerting its influence overseas and therefore the first true test of the new Cherokee fleet. In two wars spanning as many decades, the king's admirals were able to defeat the navy of the Portuguese Caraibas and capture the poorly defended island of Cuba, but did not have sufficient ships to prosecute an assault on the colonial capital at Tortuga. Even so, by the end of the wars the Cherokee controlled almost half of the region's valuable production and a quarter of its even more lucrative trade routes. Reacting to a slow but steady growing absolutism in the Cherokee monarchy, scholars and nobility alike banded together in an effort to promote the revolutionary ideals of representative rule among the Cherokee people, and they were fortunate to find a sympathetic ear in King Kolakusta. With a diverse education and philosophical leanings, the king harbored such progressive ideas himself and did not fear increased agency among his subjects. Though it may have been to the lament of his successors, the king's approval of a Cherokee National Council won him widespread popularity across the kingdom and allowed for representatives of the kingdom's demographics to have some small voice in the workings of the greater Cherokee administration. Though great progress was being made in the unification of the Iroquois and Cherokee administrations, a wave of reactionary populism derailed relations between the two nations when Duke Skenendoa II was revealed to have sought support from the British king against his liege. While King Kolakusta desired to repair the relationship, the duke invited troops from Great Britain and New England into his lands to defend Onondaga before declaring the independence of his people and forcing King Kolakusta to martial action. Aware that continuing the pursuit of a diplomatic solution would only allow the British time to entrench themselves on his borders, the king ordered his commanders to secure the towns of the Iroquois by any means necessary. The impending assault forced the Iroquois and New English forces into retreat and secured the coastline against an initial British landing, but British forces were able to pillage unopposed in Texas and were raiding into Mississippi. Onondaga and most of the Iroquois nobility had fallen into Cherokee hands, and as British forces gathered in Newfoundland to launch an attack into the Iroquois duchy, the king leveraged these assets to reach an agreement for return to the status quo with Duke Skenendoa II. Though they were still subjects of the Cherokee crown, peace was pronounced between the two nations and Iroquois autonomy had been strengthened, if only for several years. In order to challenge English and Portuguese control over the gold mines of Mexico, the king of France decided to exercise his overseas authority and gain a foothold in the area by invading the lands of the Totonac. When the Cherokee intervened to support their southern neighbor, the French took the opportunity to invade Cuba and occupied the eastern half of the island before the Cherokee fleet was able to land enough forces in Havana to confront the aggressors. Cuba was successfully defended and the French invaders were killed or captured, but in Mexico the Cherokee and Totonac forces suffered defeat and a slow retreat before the consolidated might of the French army. A concentrated counter-attack by the Cherokee brought the war to a stalemate, and Nacom Tenoch of the Totonac, sympathetic to the suffering of his people, negotiated the ceding of coastal Totorames to the French in exchange for the withdrawal of their forces. Initiated by King Kolakusta shortly before his death, King Necatee inherited a reignited conflict with Great Britain upon his ascension to the throne in Cheraw. In defiance of the British seizure of the Totonac's lands along the Mexican coast, the Cherokee commanders had occupied the disputed territory and launched an invasion of New England and Newfoundland. British troops stationed in New England chose to defend the population centers at the port of Androscoggin as they awaited reinforcements and were able to repel Cherokee assaults for many months before finally breaking under the renewed pressure. Livonian and Austrian allies supported British attempts to resecure the ports of Newfoundland, but their uncoordinated and half-hearted operations met with only temporary success. After four years of access to their remaining assets on the continent denied, the British king agreed to withdraw his interests from eastern Mexico, Maine, and Acadia. As the brother to the childless King Kolakusta, King Necatee had already been a revered elder at the time of his coronation and therefore the short length of his reign came as little surprise to the Cherokee people. Necatee's only heir was his adolescent daughter, and a council of regents held the reigns of power until her majority. Without sufficient resources to integrate the tens of thousands of English subjects that had recently been annexed in the northern reaches of the kingdom, the council approved the formation of the semi-autonomous government of Acadia under Duke Sawanooekee Degataga, cousin to the young Empress. Similar concessions followed for the Castilian and Totonac communities on the kingdoms southern frontier. Since the rebellion, the parliament of Cheraw had pursued a subtle but persistent strengthening of the bonds between the central government and Onondaga. Within two decades, the Iroquois administration was inseparable from the Cherokee and its autonomy entirely cosmetic. While this change brought concern to the leaders of the neighboring Ottowan, Huron, and Acadian duchies, no threat to stability emerged. ​The impending unprecedented rule of a Queen, one rumored to be of illegitimate issue to the late King Necatee, allowed Disruptive factions among the Cherokee nobility to press the claim of a sympathetic, but more distant relation to the old king. Crowned in Yustaga, Onanoota Cheasequah, was immediately declared a traitor to the people by the council in Cheraw, and the next year saw their rebellion restricted to Florida as they were unable to capture the fortress at Hitchiti. When it became clear that the rebellion was gaining no further momentum, their military assets melted away before the advance of the true ruler's army and Onanoota would spend the rest of his days in captivity. The Cherokee kingdom had come to encompass far more than the Cherokee people, and with the extension of Cheraw's influence over Acadia and Tamaulipas, the numbers of English and Castilian subjects under the kingdom's banner rivaled those of native Cherokee. Furthermore, the government of the Cherokee had come to represent and defend the interests of all the native tribes of the continent, including but not limited to the Huron, Iroquois, Sioux, Shawnee, Choctaw, Chickasaw, and Arapaho. The Cherokee alone had successfully defended the lands of these people from the grasp of the European powers, and the Degataga monarchy had repeatedly shown their resilience against rebellion and insurrection alike. In recognition of this diversity and in celebration of their hegemony over the continent, Asmita declared the formation of the Cherokee Empire and used the opportunity to pass sweeping changes through her administration aimed at increased efficiency in regional government and enhanced prestige abroad. Weakened to a pitiable state by many years of warfare with their English neighbors, the French colonists of Canada were unable to mount a resistance to the advance of the Huron and Ottawan military into their territory. With the subsequent loss of control over the St. Lawrence River, the French lost almost all leverage over the northern trade routes to the vassals of the Cherokee. Empress Amita continued to expand Cherokee influence into the neighboring trade spheres by pursuing claims on the ports and plantations of the Caribbean. The colonies of Caraibas may have been a threat to the Cherokee in past decades but no longer dominated the ocean waters, and with no allies to assist them, the colonist were unable to resist the forceful seizure of their holdings. 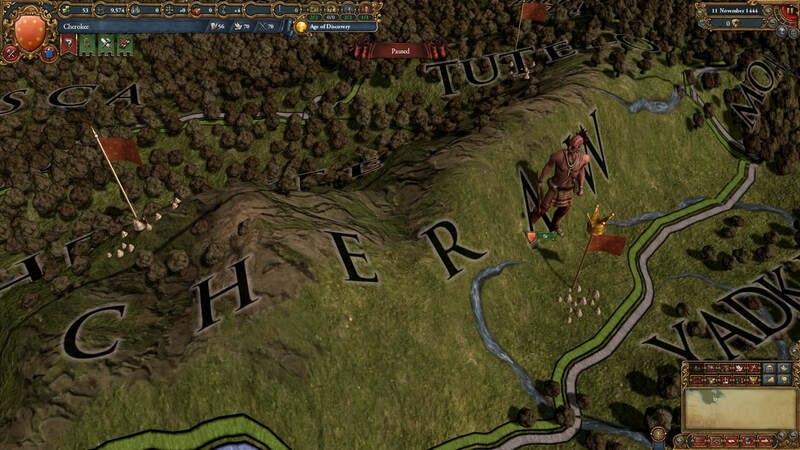 After defeating the defenders on the island of Hispaniola, the Cherokee commanders met little resistance and the majority of Portuguese production in the region fell under the Empress’s control. Out of the European powers, only the French emperor possessed the military might to press their claims across the ocean in the face of the advancing borders of the Cherokee. In previous wars against the Europeans their control over the seas had been an undeniable advantage that the Cherokee commanders had been forced to accept, but now the Cherokee empire boasted prosperous maritime communities all along the eastern coast and in the Mississippi delta. By tapping these resources, Empress Asmita had successfully extended her influence into the Caribbean Sea and now her fleets faced a proper test as the French attempted to reclaim the settlements of Canada. The Cherokee admirals were unable to prevent the French from landing in Acadia but did maintain control of the Cherokee coastlines and island holdings and prevented French forces from being reliably reinforced. French colonists from Columbia and Western Mexico supported their overlord, producing many fronts in the conflict but also allowing the Cherokee to concentrate their efforts on these divided threats separately and defeat them without having to confront the united power of the French Empire. 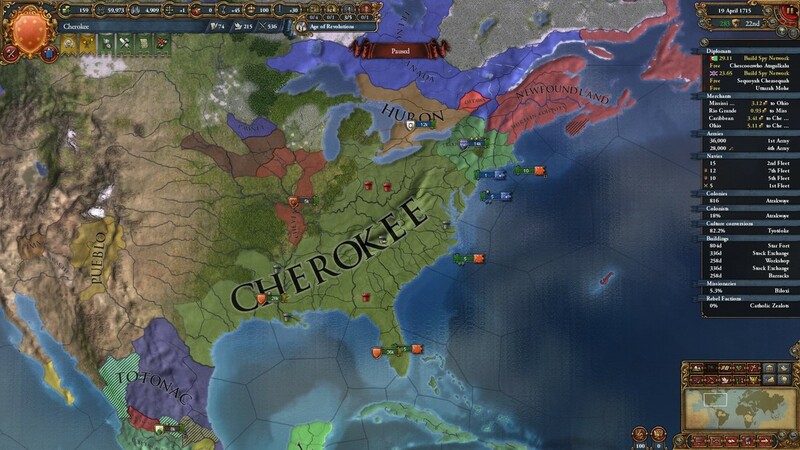 It took many years to exhaust the French will to fight, but the war left the Cherokee with greatly extended control over the settlements of Mexico. 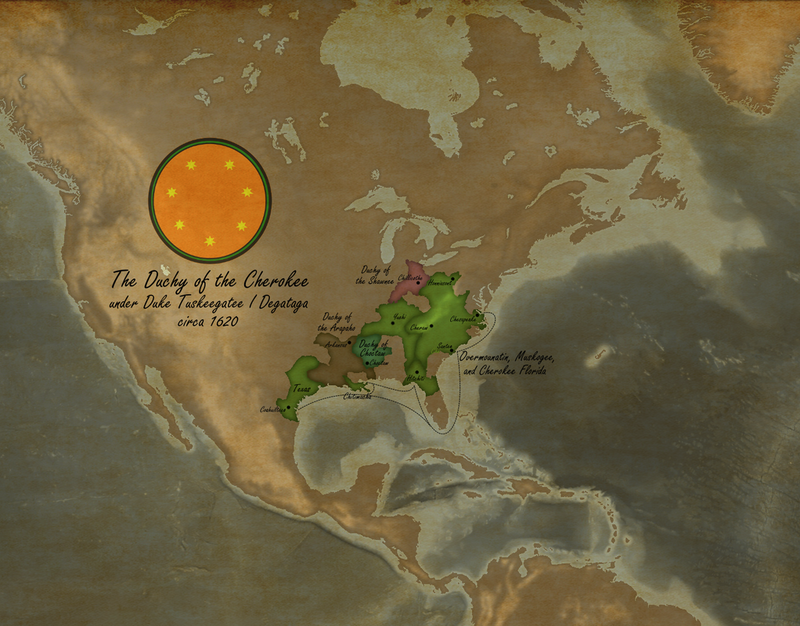 With such a great distance between Cheraw and Mexico, Empress Asmita created the autonomous duchy of Gran Chichimeca seated in the small mountain town of Guachichil. Empress Asmita's son and heir shared his mother's ambitions and continued to forcefully bring the neighboring European settlements into the Cherokee Empire. The English government of Newfoundland was unable resist the arrival of the Cherokee army nor garner support from Great Britain, and was quickly subjugated and absorbed into the government of Acadia. 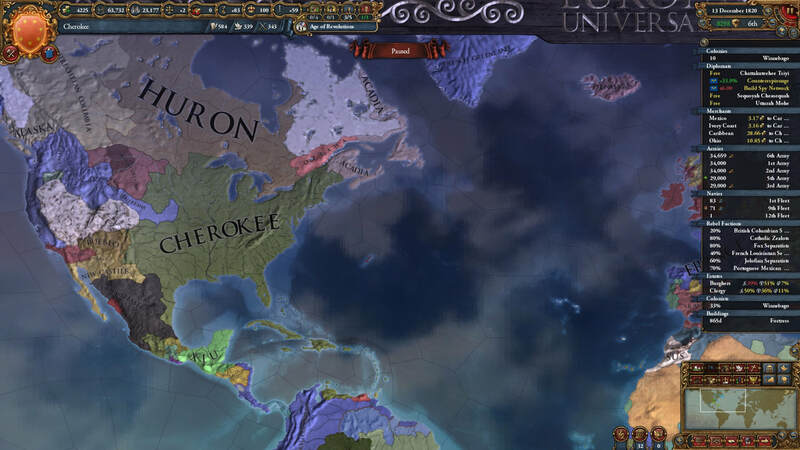 To complete Cherokee conquest of the eastern coastlines and remove the last friendly harbor for the French Empire, the Cherokee commanders led their men into the inhospitable northern reaches along the Hudson Bay. The sparsely spread settlements of French Canada could not muster a notable army and more soldiers died to the cold than to the defenders of Fort Sainte-Anne. After the fall of the fort, the vast tracts of the northern wilderness became part of the Huron marches. A few years after the northern expedition, Emperor Necatee's generals found themselves the hot hinterlands of Mexico pressing the claims Gran Chichimeca over the diverse towns and villages of western Mexico. Like the English colonists, the Portuguese colonial governments could not rely on any support from across the Atlantic. Despite a few taxing sieges of strategically important mountain forts, the Cherokee quickly seized the province of Jalisco and much of its surrounding land from the forces of Portuguese Mexico, forcing their government to abandon all but their most southern territory. The actions of the Cherokee fleets also allowed the capture and conquest of Curacao and ports along the Venezuela coast giving the emperor a foothold on the southern continent. Immediately following the war with the Portuguese, Emperor Necatee invaded the lands of French Mexico but was killed by artillery while personally leading the siege of Fort Metztitlan. His successor continued the war, driving the French defenders to starvation and capitulation and brought the prosperous cities of central Mexico under Cherokee dominion. The numerous gold mines of the provinces would no longer fund the colonial ambitions of the Europeans. The French Empire launched an immediate response to the Cherokee conquests in Mexico and bloodshed erupted all along the Atlantic as the French attempted to invade Acadia and the Caribbean islands. While the naval conflicted stalemated, with Cherokee and French fleets alternatively attacking each other's trade, Cherokee and allied forces occupied a significant fraction of the enemy empire's vast colonial domain. Eventually, the French admitted defeat once again and relinquished the small island chain of Cape Verde to the Cherokee in reparation. Emperor Nematuah died while his son was still quite young, leaving the his heir in the care of a regency council. Excepting an isolated revolt in Arkansas instigated by a local noble with ties to the throne that challenged Tsiyu Gansini's rule over the western territories, the council's rule was stable and prosperous. Unfortunately, Emperor Tsiyu Gansini was plagued by illness after he achieved majority and directly ruled the empire for only three years before his death. ​Her husband's early passing left the 22 year old Empress Inoquer as regent for her young son, Kunnateelah. She proved capable of rallying the government and Cherokee people around her during the invasions of the French and English and peacefully passed the reins of power to her son upon his majority. With rumors of weak and divided leadership with the Cherokee monarchy after the death of Emperor Tsiyu Gansini, the French Empire launched another invasion of focused on the gold mines of Guerrero. However, any divisions within the Cherokee that might have existed were pushed aside in favor of a united war effort, while France proved unable to secure valuable support from French Peru and La Plata, leaving French Colombia outnumbered and at the mercy of Cherokee occupation. The Cherokee navy fared better against the French than it had under Emperor Nematuah thanks to heavy investment during the years between, and the war saw blockades of Bordeaux and the English Channel by Cherokee admirals. Handily defeated, the French emperor ceded much of his sparsely populated territories along the western borders of the Cherokee Empire and some important ports along the coast of West Africa that would bring leverage to the Cherokee in the Asian trade that passed through the Ivory Coast. The Cherokee administration struggled to efficiently govern the vast distances and diverse populations that inhabited its borders and had increasingly relied upon well supported but autonomous local governments as its influence expanded. Part of this strategy was to support any smaller independent native governments against aggression from European colonial ambitions and this was normally achieved simply through alliances or guarantees of military support. When Great Britain and its colonies invaded the lands of the Pueblo, along the far western borders of Cherokee control, Empress-Regent Inoquer was forced to follow through on these guarantees and send her commanders to meet the English invaders in the rugged drylands. The English performed poorly against the challenge of Cherokee intervention and their forces were quickly routed to the western coasts, leaving the Pueblo and Gran Chichimeca as the new overlords of English settlements throughout the region. The duchy of the Cheyenne was a strained conglomeration of divergent western native tribes and European colonial settlements and had consistently struggled to retain stability and solvency. 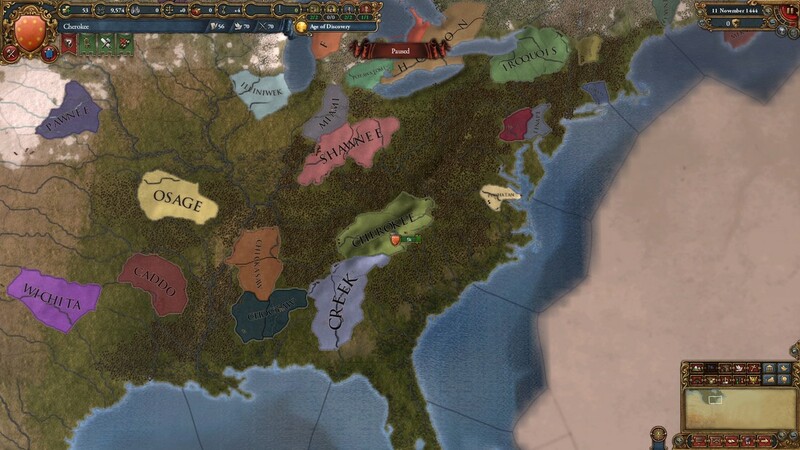 The duchy had refused to officially adopt the Christian faith of the Degataga emperors and was now seen as a liability to the western expansion of Cherokee culture. Fortunately the Cheyenne nobility remained grateful and receptive to political and financial support from Cheraw and accepted their dependency as the parliament there began to centralize most of the duchy's former political autonomy. Over time, the nobility of the Cheyenne lost any real political influence outside Illinois.